Don’t fear the fur! Transform that wild fuzz into a neat beard that is sure to attract women like bees to honey. Nourish and groom facial hair into any style and shape. 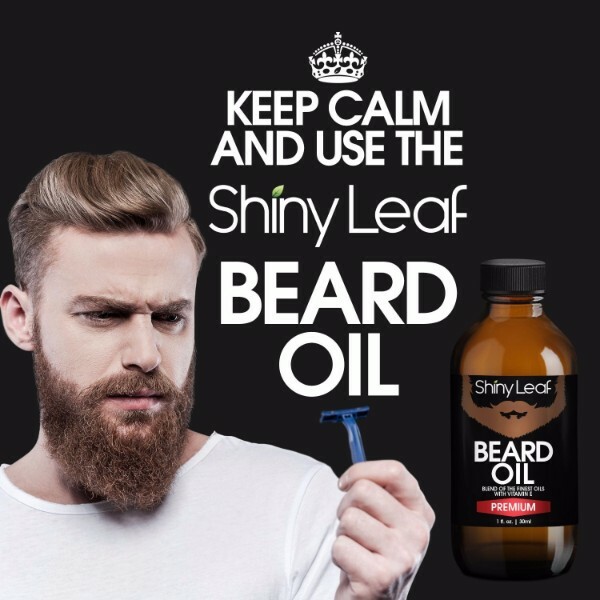 With Shiny Leaf Beard Oil, grooming beards and mustaches are easier and more enjoyable. This premium blend of various essential oils will work to soften stubble for pain-free styling. Every drop of beard oil contains the abundance of minerals and nutrients that come from the high-quality essential oils infused in it. This blend has achieved a synergy among the variety of oils that gives it boosted effects. Argan oil works well to condition beards for better management. Aside from this essential oil, there’s also sunflower oil, clove bud oil, Norway spruce oil and orange oil that gives it a citrusy trace to its deep pine scent. Apply on facial hair and notice immediate results of softer and silkier beard and mustache. 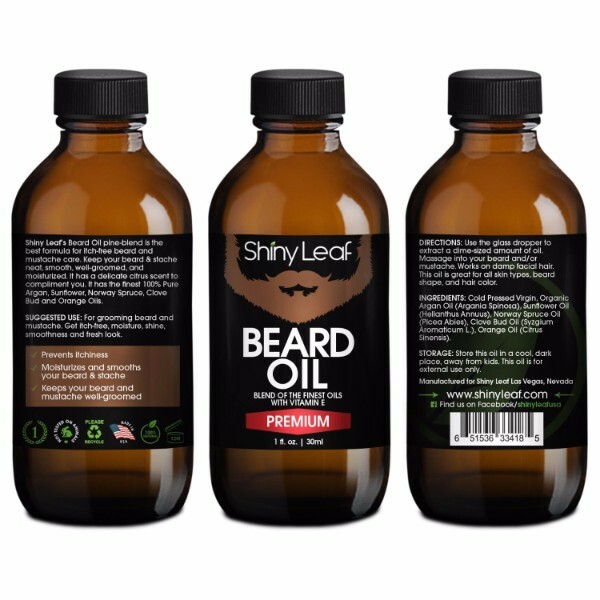 Bathe each strand of hair in the rich vitamins of nature that works well to nourish and moisturize beards and skin. Make any type of facial hair submit for easy handling. Beards of any length will improve with regular use of Shiny Leaf Beard Oil. It is easy to absorb and will immediately moisturize stands and skin from deep within. It is also effective in treating facial hair care concerns. It helps prevent weakening of strands by promoting a more resilient growth of hair. It also protects strands from breakage which is a common cause of split ends and frizzing. Skin can get irritated and itchy when exposed to wild facial hair. 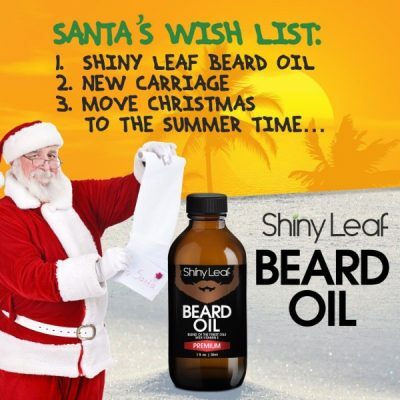 Shiny Leaf Beard Oil will not only tame grizzly fuzz but also soothe skin to chase away itchiness and irritation. Here’s your ticket to affordable and pain-free grooming. Stride with confidence as you sport a neat and suave style of beards and mustaches. Shiny Leaf Beard Oil comes in a sophisticated pine scent with a trace of citrus fragrance. Highly moisturizing and conditioning for hair and skin. Can be mixed with other skin care products. Works well as leave-in conditioner. Shiny Leaf Beard Oil is a premium blend of high-quality essential oils. 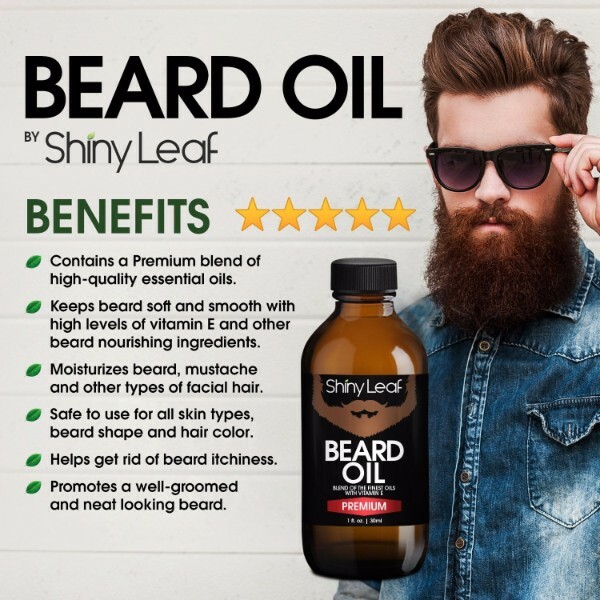 Multi-purpose beard oil that works well to nourish and hydrate facial hair. Leaves beard and mustaches softer and silkier. Protects skin from irritation and itchiness. Can be used for styling and grooming. 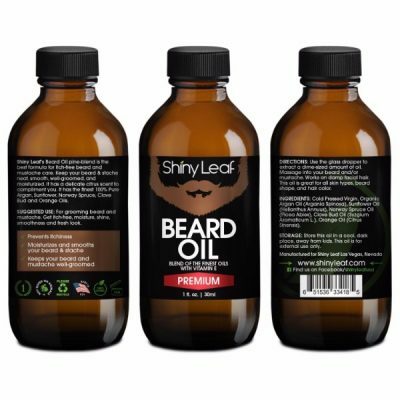 Shiny Leaf Beard Oil is a premium blend of various essential oils. 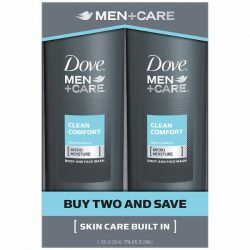 Perfect for grooming, styling, and as leave-in conditioner. Can be used any time of the day. Make sure facial hair is washed before applying beard oil. Works on damp beards. 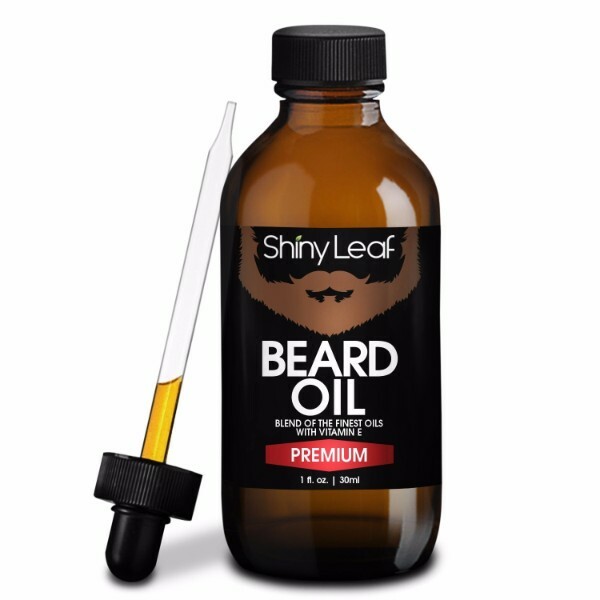 Use glass dropper to take dime-sized amount of beard oil. 3-4 drops are enough. Spread evenly on both hands including fingers. First, apply oil on sides of your beard. Use downward motions to distribute hair on cheek and jawline. Then apply oil on the front of beard, making sure to cover facial hair from roots to tips. Use both hands to comb through beard from the bottom. For mustaches or goatees, use fingers to apply oil. Use fingers to comb through facial hair and smooth out strands. It helps distribute oil evenly. Groom into any desired style. Can also be used for trimming. Cold Pressed Virgin Organic Argan Oil (Argania Spinosa), Sunflower Oil (Hellanthus Annuus), Norway Spruce Oil (Picea Abies), Clove Bud Oil (Syzgium Aromaticum L.), Orange Oil (Citrus Sinensis).